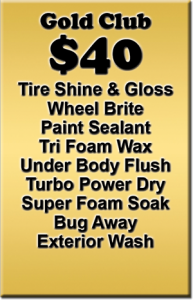 Join the Long-Lewis™ Tunnel Wash Keep It Clean Club and receive unlimited washes on your vehicle all month long. Simply join the Club at any of our locations directly at the pay station and redeem your receipt with the attendant. A small bar code sticker will placed on your car at the time of the purchase. Your Credit/Debit Card will billed monthly or you can do a one month trial. You can stop the Club program at any time. It’s simple to join and the savings go a long way. Works at any Tunnel Wash Location. at the Muscle Shoals Location Only. Appointments are recommended but not required. 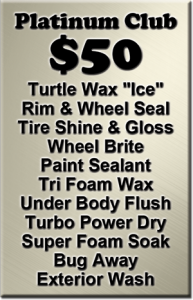 Please click here or call (256) 386-0979 for an Appointment. The Works! – Save $10! All of the Above. Includes 2 Seat Rows. Notes on Extreme Mud or Excessive Trash If your vehicle has extreme mud or excessive trash, there may be an additional charge to prep it for the services above. High winds in the tunnel will blow most trash from pickup beds, therefore all open areas must be completely free of trash and debris. Notes on Seat & Carpet Drying It takes approximately 2 hours for seats and carpets to dry with the heater. We recommend these dry thoroughly so that they do not mildew and start to smell. We dry them with the heat in the vehicle with the vehicle running at idle speed for the amount of time. 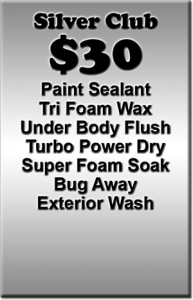 If you choose not to wait on drying at our facility this can be done on your personal time. We will provide you with seat covers and mats for the floorboard to get you to your destination. 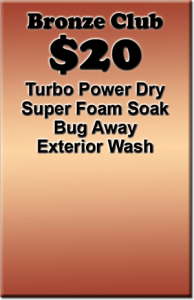 Again we strongly recommend these be dried thoroughly either with the dry heat or windows down and doors open until the moisture has evaporated.